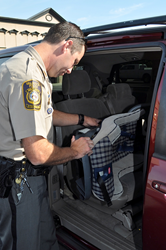 On September 26, 2015, the public is invited to attend a car seat safety check event sponsored by Studstill Firm, LLP during Berrien County’s Great Harvest Festival. Law enforcement will be helping parents ensure their children are properly secured in car seats. The attorneys at the Studstill Firm, LLP are hosting a free car seat safety check during the Berrien County Great Harvest Festival in Nashville on September 26, 2015. Members of the Berrien County Sherriff’s Office and the Georgia State Patrol will be on hand to help parents learn how to protect their children in a car. During this free car seat safety check, trained technicians teach parents how to properly install and use their car seats. By simply learning how to correctly use car seats, parents can reduce their child’s risk of death by as much as 71%. Parents can drive up to the event and have their seats inspected to verify that they have the correct seat and that their seat is installed correctly. Parents can also learn what kind of seat they need for their children and even where to get the proper seat for their child. The event is being held in the parking lot of the Berrien County Administration Building located at 201 N. Davis Street in Nashville, Georgia on Saturday, September 26, 2015. Trained safety seat inspectors will be on hand from 11:00 am – 2:00 pm to help parents check to be sure that their seats are the right size for their child and that they are installed safely. Unfortunately, motor vehicle crashes are the leading cause of death among kids 1 to 19. More than 70% of car seats are not used or installed correctly, and most parents don’t even realize it! Georgia law requires children under the age of 8 to be properly buckled in a safety seat or a booster seat unless they are 4 feet, 9 inches tall. This is because children are usually between 8 and 12 years old before they are big enough for the car’s seat belt to fit them properly and keep them safe in a crash. The Studstill Firm, LLP Injury Lawyers specialize in injuries and accidental death cases and are dedicated to helping families following a motor vehicle accident. For over 34 years, lawyers from the Studstill Firm, LLP have been working for the residents of Berrien County and surrounding areas.